President Lee Myung-bak pledged Thursday to create a cluster of research institutions and think tanks in Hongneung, Seoul to live up to his commitment to achieve low-carbon, green growth. 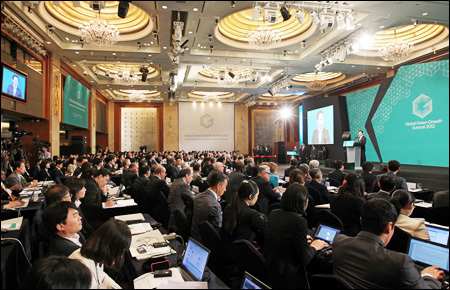 In a speech to the opening ceremony of the Global Green Growth Summit 2012 held at a Seoul hotel, Lee unveiled the plan to create a research park, dubbed the Global Green Growth Park, to achieve a synergy effect by putting relevant institutions and industries together. Hongneung is home to leading research institutions, hosting think tanks, such as the Korea Development Institute, Institute for Industrial Economics and Trade, and Korea Institute of Science and Technology. The President said the ideas and products from the state-run institutions have triggered the nation to achieve an economic miracle and develop modern scientific technology. Under the theme of green growth for all, Lee urged the international community to “act now” to achieve eco-friendly and sustainable growth. Lee elaborated the three-point action plan to achieve his initiative of green growth. According to the plan, the Korean government will launch the Global Green Growth Institute in Seoul as an international organization in October. It will also increase the budget for development assistance designed to help developing and underdeveloped countries achieve carbon-free growth, dubbed “Green ODA,” by 30 percent until 2020. Under the Green ODA scheme, Korea has passed its knowhow and expertise on water control and management on to developing countries suffering water shortages through the state aid agency. Lee’s idea of creating a research center in Hongneung is part of a three-point action plan unveiled by the President. During his speech, Lee promoted the four-rive project to prevent flooding during the summertime and water shortages during other seasons in the river basin region as a successful green growth project. Heads of state, representatives from government and international institutions and high-profile guests participated in the two-day global gathering. Those who delivered keynote speeches include Anote Tong, president of the Republic of Kiribati, Prince Frederik, crown prince of Denmark, Achim Steiner, executive director of UNEP, Kandeh Yumkella, director-general of UNIDO. Business leaders and senior staff of international institutions also joined the gathering. President Lee has spearheaded the global drive to achieve eco-friendly economic growth since he first spoke on low-carbon, green growth in a speech on Aug. 15, 2008 on the 60th anniversary of the nation’s liberation from Japan’s colonial rule. The businessman-turned-politician touted his initiative as an ideal growth model for world leaders, which has drawn positive responses from the international community. The former Seoul mayor initiated a massive urban beautification project to transform central Seoul into a scenic, eco-friendly stream. The facelift of Cheonggye Stream has drawn many local and international tourists. Lee’s going-green initiative helped him win the landslide victory in the 2007 presidential election.